There are certain books – not many- that I pick up to read and soon put down, not because I don’t fancy them, but I simply didn’t feel it was the right time (for either the book or me) to read it. 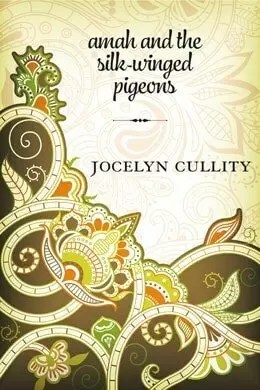 Such was the case with Jocelyn Cullity’s Amah and the Silk-Winged Pigeons (2017, Inanna Publications). At the time I was not ready to read a book with exotic names and a locale I was not familiar with. The history of India is not well-known to me and my brain wasn’t ready to take on a work of historical fiction such as Amah. Consequently, it languished near the bottom of my TBR (to be read) stack. Then, one day I was ready to give Amah a second chance, I am happy I did! As I read this book, I quickly came to discern what an exceptional work of historical fiction it was. This is where Amah’s extraordinary story begins. The British are auctioning off the King’s animals while he has been exiled to Calcutta. Amah is a member of the Rose Platoon, an elite corps of female military guards of African descent who have protected Lucknow’s royalty for generations. smells whiskey on his breath, hears hatred in his words. He puts his hand across her rifle, and stops her from going forward. She reaches out to stroke her mare despite him. The auctioneer mops his face with a handkerchief, slams down his hammer, and nods toward an Indian merchant, a foreigner from far away. The Englishman’s hand stays firm against Amah. “The horses have sold, African slave boy,” the man says. …She pats the animal’s warm flank, as if everything is alright, before she leaves the auction to find Begam Sahiba, the King’s ex-wife. Together with Begam Sahiba, they try to find ways to get the King back in power and hold back the British who are inundating the city and wresting control away from the inhabitants, knocking down temples to make way for roads and taking land rights away from farmers and taxing them beyond their means. They exist in an untenable situation that gets graver day by day until the British push them too far and rebellion appears to be the only recourse to save the city they love. Amah is a very strong person; she doesn’t want to leave Lucknow (as her mother does to be with the King’s entourage) as she feels it is her place to watch over the King’s belongings. Her implacable aunt torments her for not following her mother’s example, but Amah is resolute in her determination to protect the city. Begam Sahiba is also a strong-willed woman of action, using monies of her own to feed, equip and pay a small contingent of the King’s loyal followers to repel the British. As I read this book, I quickly came to discern what an exceptional work of historical fiction Amah was. It is more history than fiction, actually. The outcome of Lucknow can be read in any history of India, but what transpires in the minds of those who see their beautiful, peaceful city fall into the hands of those that would oppress them, taking what is not theirs, is what Ms. Cullity truly excels at. You immediately side with Amah and Begam Sahiba against the heavy-handed British and those such as the evil and seditious Abhi whose greed keeps him close to the British. Begam Sahiba and Amah both see ghosts, feel their thin residues of comfort, hear skeletons of melodies they once knew. Their hands pick at the stones beneath them. Stones that border the English rose garden near the Residency [where the British live], that were used to build the old English church. A beautiful, transcendent story of colonial India, it deserves to be read by those who appreciate strong female protagonists as well as those who would like to learn more about the injustice of forced colonization (and destruction) of cultures that were flourishing in their own right, much like that of Canada’s indigenous peoples before First Contact with Europeans. Amah and the Silk-Winged Pigeons will go on my long list for a “Very Best!” Book Award for Historical Fiction. I still have this one on my pile to look forward to! I’m pretty sure you’ll love it too. Strong female characters and a historical backdrop.